CHUCK D once said "Most of my heroes didn't appear on no stamp" referring to the lack of recognition many of the african american heroes received. 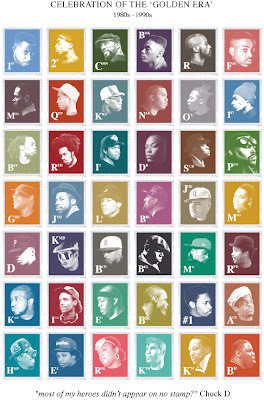 The same could once be said about many of our hip hop idols of yesteryear, but now you can see many of the biggest figures from the golden era of rap on this limited print featuring 42 postage stamps bearing the heads of DJs, producers and MCs that made an impact on hip hop culture throughout the 1980s and 90s. You can grab a copy of the A2-sized lithograph print for your wall and also purchase a tee shirt bearing the same picture direct from MADINA's online store. cool post man...! right on to Madina!